I woke up this morning with a severely pulled muscle in my neck. I figured it was a good excuse to sit on the couch and catch and old Bogart/Bacall movie. I’ve owned this for awhile, and been meaning to see it. I’m currently reading Rose Madder by Stephen King, which is another book with ties to the Dark Tower saga, and King quotes a passage from the Dark Passage novel. Since reading that, I’ve been looking for an excuse to finally see this film. This is a bit of a unique noir. For one, there is much more daylight than noir aficionados are used to seeing. Secondly, the femme fatale is not a very dark character. Mix those elements with the first-person filming of the movie’s first act and a half, and you have a very individualistic film. Bogart‘s face isn’t seen until over an hour into the film. His character undergoes plastic surgery, so the first act of the movie has him in shadow or utilizing a first-person perspective as we hear only his voice. 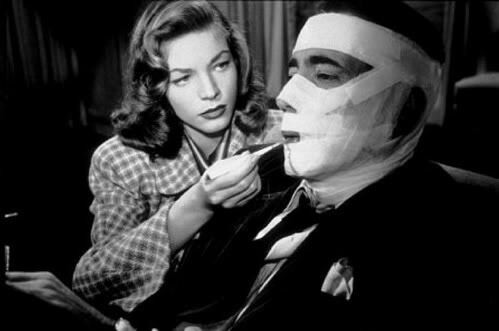 Once the surgery is done, his face is bandaged for another twenty minutes and the character is not permitted to speak. This leads to a Bogart performance like no other. One that relies just on voice, then just on physicality, before putting the entire package together for the film’s last act. The Bogart/Bacall chemistry is great here (as always), and Bruce Bennett brings great humility as Bob, a character who could have been very cliche. The writing is mostly good in the dialogue, though the plot is full of unbelievable coincidence. They try to pass this of by explaining a few of them in the third act, but there are still six or seven major points (many of which are spoilers) which just seem very convenient. But these points don’t detract from the fun of this movie. This is just a great, old-fashioned, noir, with enough originality to be required viewing. ~ by johnlink00 on August 27, 2010.